It’s not exactly hard to figure out Site Build It’s angle. It’s named “Site Build It,” (sitesell.com) for crying out loud. It’s not trying to be complicated: it’s a simple marketing message and it’s a simple service. In this day and age, that can be a very good thing. The problem is that there are plenty of simple website builders out there. Weebly can have you building a site before you reach the end of this Site Build It review. Yahoo! Site Builder isn’t exactly a slouch in the ease-of-use department, and we don’t mean that as a knock on them. Heck, if you want a blog all you have to do is visit Blogger.com and you’ll be up and running in no time. Simplicity abounds on today’s Internet. So why Site Build It? Why choose this service over any of the others? Let’s dig a little deeper in the features, services, and offerings at the Site Build It headquarters and see if we can figure out what has made this popular service such a big seller in the sitebuilding niche. If you Site Build It, Will They Come? Unlike your Weebly, which is simple enough to use that its main attractive quality is its simplicity, Site Built It is a little more ambitious without trying to get too complicated. Technically listed at SiteSell.com, Site Build It is more about the business of building a website and subsequently marketing it. 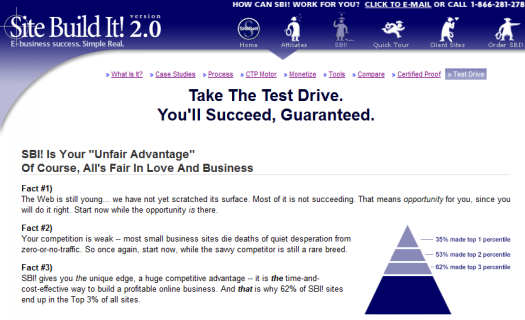 You won’t only find easy templates at Site Build It: advertising themselves as “E-Business Success” in a can, they’re here to help you make money. This is an intriguing prospect for many of us, of course, so it’s really not so hard to figure out why Site Build It’s message has resonated with a lot of people. Site Build It certainly doesn’t get by on its looks: its web site essentially reads like a sales page. If any particular sitebuilder was likely to launch an infomercial campaign, it would be Site Build It…well, and maybe GoDaddy – but that’s another review entirely. Says Site Build It, “SBI! handles all the technology and complexity for building a successful online business.” Clearly the goal is not to merely publish a site, but to publish a business – something that’s earning you money in your pocket. If everything goes according to plan, a service like SBI pays for itself. But it’s got to deliver the goods if it wants to make that promise. Clearly, everything is tailored around making you a business success, not merely a blogger or someone who feels like posting a few recipes. This requires that you have some sort of niche, product, and/or service in mind. SBI is clearly not for the Facebook user who simply wants a way to put up a website hosting their wedding photos. Instead, SBI is a way to get off the ground if you’ve already had a business idea floating around in that mind of yours for some time. Sure, you can start out with SBI if you’re not sure about your niche yet, but why would you want to? Starting a business is difficult enough – worry about the big things first. There are plenty of tools like SBI to help you out when you finally know what you plan to do. But the question remains: once you have a business idea, is SBI really the way to proceed? Since SBI would probably be considered competition with a small business portal like Intuit rather than a simpler provider like Weebly, it’s up against some pretty stiff competition. The aforementioned features are nice bonuses. Easy integration with analytics and other marketing-oriented features should be considered big benefits to going with SBI. But if you want to find what really separates SBI from the competition, in my mind, you’ve got to look at something very simple: guarantees. I’ve already mentioned that Site Build It looks like a large sales letter, the kind of sitebuilder you might imagine would be advertising on television at two a.m. in the morning. But if you’ve ever bought a product form an infomercial or a sales letter, then you know there’s often a great benefit to making the purchase: the guarantee. It sounds like a used car salesman’s tactic, but it’s an important piece of the puzzle. Higher-end products won’t always necessarily offer a guarantee, but that’s the advantage of trying out something like SBI: some assurance that you’re going to like the purchase you’ve made. Before the guarantee, of course, is the test drive. It’s always a major bonus when a site like SBI can offer you some way of previewing what you’ll get for your purchase. If you can use the product for free before you make the purchase, you should. There’s no better way to compare two different products – for example, Intuit also offers a free trial for its sitebuilding services. But there’s more to the story when it comes to SBI. A 90-day satisfaction guarantee comes with your purchase, giving you plenty of time to essentially test the product out for yourself. If you like what Site Build It has done for your business, you can keep it and your purchase will have been worth it. But if you don’t, simply ask for the refund that’s been promised to you and your bottom line won’t be affected. Site Build It may look like something a little shady, but between the good features and product guarantee, there’s actually not a lot to be turned off by. At the very least, give this free trial a go so that you can find out whether or not SBI is really the right fit for the kind of website you’ve wanted to build. Hey, it can’t hurt. Pull the trigger on something like SBI and you’ll be well on your way to taking the action needed to get your site up. These things won’t build themselves, you know. I’m confused by your review of SBI. How do you really feel? Based on your review, I wouldn’t go with SBI. Is that your message? C’mon, be real, so we’ll come back. I hear some bad news about GooglePlus. I do not understand how it affects them. Can you give some explanation? Is it true that GooglePlus will make things harder for website owners? and how about for the SBI website owners? Eric, I don’t know that much about SBI, but I can speculate that all of the changes Google has implemented to filter out the little guys sites (or ones they think are low quality) over established brands might be one thing that could have an affect on SBI people.